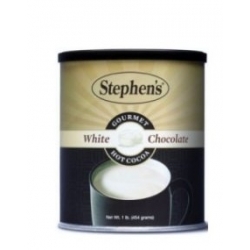 Made from only the finest ingredients, Stephen's Gourmet Pumpkin Spice Hot Chocolate is quite simply the richest, creamiest, most flavorful cocoa you have ever tasted. Gluten free. Ingredients Sugar, Sweet Whey, Maltodextrin, Partially Hydrogenated Coconut Oil, Corn Syrup Solids, Natural & Artificial Flavor, Non-fat Dry Milk, Sodium Caseinate, Salt, Mono and DiGlycerides, Guar Gum, Dipotassium Phosphate, Cocoa (Processed With Alkali), Caramel Color, Cellulose Gum, FD&C Yellow #6, FD&C Yellow #5, Soy Lecithin. Directions To 6 oz. of hot water add one scoop of Stephen's Hot Cocoa Mix. Stir well and enjoy. For an extra creamy taste try adding hot milk.